Muddy Loafers: EVA LOMBARD – PIONEER MEDICAL MISSIONARY. EVA LOMBARD – PIONEER MEDICAL MISSIONARY. On the west coast of India and hugging the Arabian Sea, is the temple town of Udupi famous for the Krishna Temple and the eight mutts – a seminary for Brahmin boys. Into this stronghold of Brahmin orthodoxy, stepped Eva Lombard a young Swiss doctor, diminutive in stature but with a strong spirit and an incredible capacity for work. Maternal and Infant mortality was very high in these parts as doctors were few, and female doctors were unheard of. Though opposition to missionaries was strong, the town welcomed the missionary doctor. 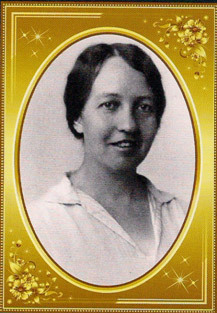 On 15th June 1923, Eva Lombard opened the Basel Mission Hospital in Udupi. It was just a 6-bedded cottage hospital that promised to minister to the needs of women from all sections of society. Most of the work was domiciliary. The brave young doctor travelled to the homes of patients on foot or by bullock cart or boat. A car came many years later. Deliveries were conducted in outhouses or cattle sheds as women were considered unclean for forty days after child birth. Everyone who mattered turned up for the inauguration. Important men with gilt-edged turbans or colourful headgear drove up in jutkas. They appreciated the fact that at last, medical help would be available to the women and children of the area. In 1921, Eva travelled to Mysore, and spent a year at the Mission Hospital there, getting acquainted with various tropical diseases and learning the local customs and language. 1923 brought her to Udupi. Under her care and guidance, the hospital grew over the years into a multi-specialty hospital with 200 beds, and a nursing school. But this was a Herculean task as money was always in short supply, and most of the patients were too poor to pay or could only pay a pittance. Though the town representatives had promised to contribute towards running costs, they were merely empty promises. The hospital had to rely on subsidies from the Basel Mission in Switzerland. After World War II and when India became independent, things became tougher. Sometimes there was no money to buy medicines or pay the local staff. It made the good doctor more dependent on God. TB patients were a sadly neglected lot. So in 1952 a sanatorium was built where patients were cared for with much love and dedication. Outreach work was started simultaneously with the opening of the hospital. This remarkable woman devoted the best years of her life to service of the poor. They were her friends. Women and children were her special concern, but prayer was her forte. She worked hard and expected the same from her colleagues. In her was the will to render service. This is what steered her into a life of love, compassion and dedication. It is amazing to know about Dr.Eva Lombard who has done such amazing service to India.Thanks for writing this wonderful article.